Teckwin Technology was honored to print the graphics symbolizing the 16th Asia Games for the metro train "Propitious." The Asia Games named train left Guangzhou on August 29, 2009 covered in film printed by Teckwin's TeckUV 3200SR printer. "I am really proud of the graphics printed for Propitious." said Ding Jianrong, the General Manager of Guangzhou Metro Company. "The self-adhesive film was printed with eco-friendly UV ink, the most popular ink worldwide and the colors will last for 5 to 8 years. 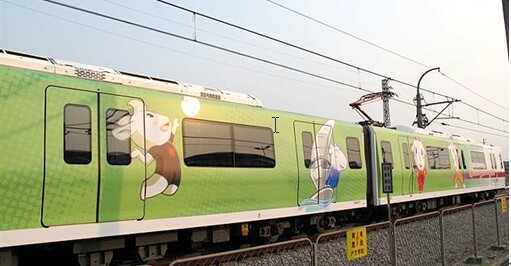 It's the first time UV ink has been used like this in Asia and for our company, it's the first time an entire subway train has been covered in advertising." Teckwin Technology is proud to have won the bid for this Asia Games project. Teckwin is also competing for other Asia Games projects that will be printed with the TeckUV 3200SR and the TeckStorm, two of Teckwin's state-of-the-art UV printers. Teckwin Technology continues to be an unequalled symbol of technology.